Home » A buried lake may have been found on Mars. What does it mean for life? A buried lake may have been found on Mars. What does it mean for life? The red Martian surface may be barren and arid, but about a mile underneath Mars’ south pole, scientists think they’ve found something remarkable. Using a ground-penetrating radar aboard the European Space Agency’s (ESA) Mars Express orbiter, a team of researchers appear to have identified a 12-mile (20 kilometer) wide salty lake underneath a massive glacier on Mars. Their research, published Wednesday in the journal Science, opens up the potential for human water supplies in similar Martian reservoirs, and even the possibility that microbial life may live in this liquid place on Mars. “We’re very excited about the observation,” Jim Green, NASA’s Chief Scientist who had no involvement in the study, said in an interview. While Green notes that scientists have spotted water on Mars before, those previous discoveries mostly centered around ephemeral surface water that might appear and disappear on very short time scales. Right: Artist’s impression of the Mars Express spacecraft. Left: Radar cross-section of the south pole’s layers, blue as water. This new finding, led by ESA scientists, however, is different. While some 12 miles in diameter, the researchers speculate the underground lake is at minimum 1 meter (over 3 feet) thick, meaning that it’s a long, if thin, underground lake. “We’ve never found a reservoir of this size that’s like an aquifer [underground water layer] here on Earth,” said Green, noting that Mars was once likely a blue planet like Earth, covered in vast oceans. This has obvious implications for human exploration of the red planet. It’s already well-known that Mars has thick sheets of ice underneath its north polar regions. But now, Mars might also have a system of liquid reservoirs near the surface, which could be of great value to astronauts — or anyone trying to settle in for a life on the red planet. Sure, this extraterrestrial water might be full of salts, but it can be filtered and made pure. “We can handle that,” said Green. What’s more, there also might be primitive, microbial life flourishing in these isolated waters, buried deep underground, hidden away from space radiation and Martian surface extremes. Many astrobiologists — scientists who study life in the universe — usually aren’t too enthused about yet another water discovery on Mars, Rebecca Mickol, an astrobiologist at the Naval Research Laboratory’s Center for Biomolecular Science and Engineering, said in an interview. Life in the Martian underworld? While this research does provide good evidence that the lake exists, there’s still no definitive proof that such a large body of water really does live under Mars’ surface. NASA hopes to improve upon this evidence with geologic observations from its InSight Lander, set to land in November. But if there is indeed a briny pool of frigid water sitting beneath a Martian glacier, life very well could have once survived there over the last 3 billion years. Or, it could still thrive today. “Because the surface of Mars is so hostile, I wouldn’t be surprised if organisms lived deep down in the subsurface, especially if there’s a source of water nearby,” said Mickol, noting that microbial life is abundant deep in the Earth. There are plenty of challenges, however, for anything making its home in this water. First of all, the lake is thought to be extremely cold. According to the study, researchers think the body of water is thought to be below freezing at its warmest, at some 26 degrees Fahrenheit (the salt content lowers the water’s freezing point). And the lake’s temperature could also be as low as nearly 70 degrees below zero at its coldest. There also likely isn’t much to eat. “They do have something to breathe — everything else is pretty dire,” Jennifer Glass, an astrobiologist at Georgia Tech’s School of Earth and Atmospheric Sciences, said in an interview. Mars is rich in perchlorate, a salt often used in propellants on Earth. This might be toxic to humans, but some microbes thrive on it, like Earth’s marine microbes thrive on carbon dioxide. And the extreme cold, too, doesn’t eliminate the potential for life. There are microbes living in cold glacial lakes in both Antarctica and the Arctic, Jackie Goordial, who researches extreme microbial life at the Bigelow Laboratory for Ocean Sciences, said in an interview. 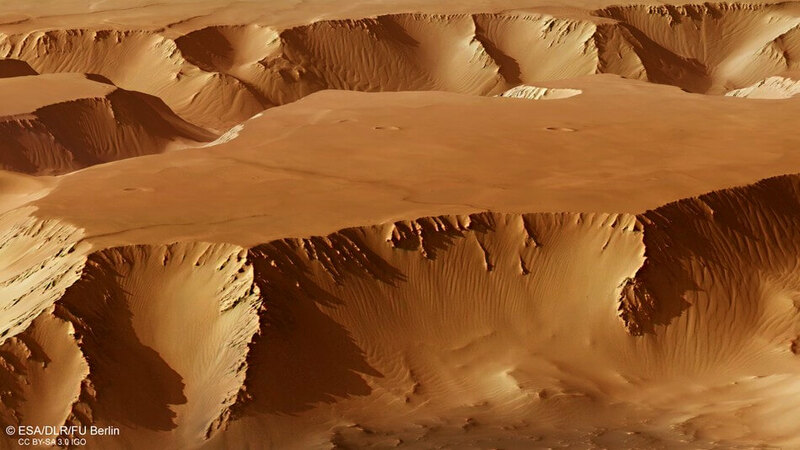 An enhanced color image of a part of Mars’ massive valley, Valles Marineris. Microbes living in frigid liquid water can withstand salt-ridden environments too, noted Goordial. “We have life on Earth that doesn’t just manage to survive, but thrives under these conditions,” she said. For this reason, scientists like Goordial are intrigued — if not enthusiastic — about the potential of a large, long-lived body of water under Mars. “If this were true, it would be quite exciting,” she said. Though, getting down there to actually obtain a sample is extremely challenging. “Drilling to 1.5 kilometers is hard, even on Earth,” said Glass. It would seem to require a spacecraft with a formidable drilling apparatus. And scientists would have to ensure that no earthly microbes aboard the robot would contaminate the alien water. “That kind of mission may be a little far off right now, but would be an exciting prospect,” said Goordial. “Actually having a sample in our hands to prove that there’s life — that’s the gazillion-dollar scientific answer we want,” said Glass.